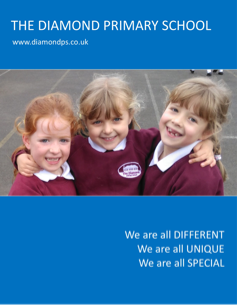 Our school prospectus provides a wealth of information about The Diamond Primary School. You will gain a feel for the wonderful, Christian, family ethos and atmosphere that has been established here which is very important in creating a culture of learning and developing. The prospectus also presents the range of activities, both curricular and extra-curricular, taking place in our school. Download our school prospectus or browse through it online.